A nearly month-old wildfire that had appeared to be standing still flared up over the weekend, burning 1,500 new acres and causing an evacuation order for a dozen homes, authorities said. 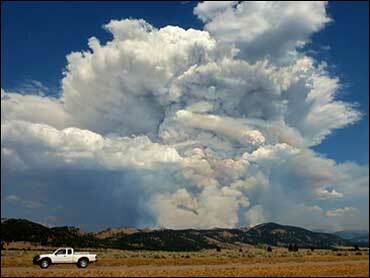 The blaze had consumed about 33,500 acres, or 52 square miles, since it started July 4. It was 70 percent contained Sunday. An evacuation order was issued for the Peachtree Community, about 12 homes spread over a wide area of the forest. Smoke drifted over Santa Barbara more than 40 miles away and was reported in Bakersfield, some 80 miles away, officials said. Residents of an additional 200 homes were told to be prepared to flee at short notice. The fire's renewed activity compelled authorities to push back their anticipated containment date from Aug. 3 to Sept. 7, Los Padres spokeswoman Kathy Good said. "What this means is that the fire's going to be significantly larger and probably will be around for a while," Good said. Elsewhere, hot, dry and windy weather in Montana helped a wildfire near Glacier National Park grow to roughly 5,000 acres on Sunday and continue to threaten an evacuated lodge. The blaze had grown from 1,000 acres a day earlier and was just 2 percent contained, fire information officer Dale Warriner said. The fire was running into heavy timber. On Sunday, authorities reopened a highway near the park in northwestern Montana, but they warned that U.S. 2 could be closed again if the blaze flared up. Guests and 18 workers at the Summit Station Lodge along the highway remained evacuated as flames burned within a mile, owner Jorge Simental said. The number of guests was not immediately available. Fire crews were protecting the lodge and tearing down some trees that were close to cabins, Simental said. No other structures were threatened, but officials in Pondera County asked residents of Heart Butte to be prepared to evacuate if needed. The community of about 700 people is 18 miles southeast of the blaze. "We're not going to call for an evacuation until it gets within 10 miles, so we've got some time," said Clete Gregory, the county's disaster and emergency services director. "We just don't want to have to pull a surprise on everyone in the middle of the night." Near-record heat and low humidity also fueled blazes elsewhere in Montana, with similar conditions forecast for Monday. A fire north of Helena was keeping people away from recreation areas and homes. The blaze, which had charred nearly 10 square miles, was 10 percent contained on Sunday, fire managers said. A 1,030-square-mile fire in southern Idaho and northern Nevada was 86 percent contained and was near full containment, officials said.